Capcom’s official Destiny of an Emperor is, unfortunately, not available in English. Fortunately, thanks in large part to a familiar game dynamic (think Koei’s Romance of the Three Kingdoms) and fairly intuitive design, it should be easy enough for you to pick this game up and enjoy it. To ease the translation, we will evaluate all of the game’s statistics and menus below, leaving only the challenge of figuring out how to balance kingdom management and battle, and victory on said battlefield, to you. In short time, you too should be able to play and enjoy this game! As usual this section draws on work from a number of other people, and I wish to credit them. First, thanks go out to lordyuanshu.com’s CommieCatGirl, Perhong_Angtong, and of course, Lord Yuan Shu himself. And I would also like to extend thanks to Scholars of Shen Zhou members Shi Tong, Niahak, and for some exceptional translation assistance (for which we are very thankful), Zhai Rong. Destiny of an Emperor III offers three separate scenarios. From left to right, Easy, Normal, and Hard. Easy will be quite challenging for anyone that has not yet figured out the game in detail. On hard difficulty, in addition to more dangerous computer characters, you also lose control of all battles in which your ruler does not participate. When you are set, this screen will display all your choices and ask if you wish to confirm. Move down to the little graphic in the bottom right-hand corner and press right to cause the man in it to face to his left, highlighting the right-hand character. This is ‘yes’, or ‘confirm’. If you press left, you are choosing ‘no’, or ‘cancel’, and you will be taken back to the scenario selection screen. And now we introduce the menus that will allow you to manage your kingdom. Much like Koei’s Romance of the Three Kingdoms series, you begin with an overhead map. Here, you can use the direction pad to select your cities or view your enemies’ territories. In the top left-hand corner you find a box that displays the current year. To the right, your action points. Your default amount is two, and whenever you perform an action in a city one will be consumed (eventually forcing you to end your turn). As you accumulate more cities, you will begin each turn with more action points (see below). A mini-map below the year shows you where in China the screen is showing. Each city in China is marked with a banner displaying the city’s name, and colored in the controlling ruler’s color (gray is unoccupied). When you highlight one of your cities and press the confirmation button, a mini-screen pops up, showing the city’s governor (or ruler), offering a cancel option on the bottom-left, and a City Management button on the bottom right. Now, with a city selected, we find our real kingdom management options. The city’s name is displayed in the top left-hand corner, with the governor’s name displayed below. To the right, in this blue box, you will find all of the city’s vital statistics. From top to bottom, Trade (kingdom resources), Farming (food), ?? ?, and Wall/Trade (defense). Your military is sorted into anywhere from one to three units which are, in turn, sorted at your option into any of the three red-tinted boxes shown above. Click on any red-tinted box marked with officers to manage individual generals. As mentioned above in City Management, confirming on the top left-hand blue area of a city menu (where city statistics are listed) brings up an option dial with nine options (presented in a 3x3 grid). The key above should help you to better understand each of these options, and if you are familiar with Koei’s Romance of the Three Kingdoms it should, for the most part, make sense without any trouble. Of the top three, the first is Personnel, with sub-menu options for Units (manage and rearrange military units), Ranks (assign ranks, promote and demote officers), and Cancel (return to previous menu). Second, Economy, features options for Trade (develop resources to manage your kingdom), Farming (food), Wall/Trade (also measures defenses in war). Third, Military, features the options Move (move officers between locations), Attack (attack a neighbor), Draft (get more troops), ??? (we haven’t seen this option available), and Cancel. Of the center three options, the left-most option is Diplomacy (manage relations with other rulers, key for weak rulers), Cancel (exits to the City Menu), and Plots (what you might expect, options to manipulate officers and neighboring rulers, but we haven’t sorted out all the specific details just yet). Of the bottom three options, the left-most gives you access to the game’s proposal system (read more on this below), the Map (get an overview of how things currently look in China, combined with some extra detail), and your Game Options, with sub-menu choices of Save (which you should do frequently while learning the game), End Turn (choose when you have nothing left to do with your action points and resources to pass over to the computer’s turn), End Game (end the game, of course), and Cancel (return to the City Menu. Destiny of an Emperor III features a Proposals system which can be accessed using the bottom left-hand choice of a city’s 3x3 options dial. From there, pick a city, and an officer in that city will present an option to you. While they will, of course, speak in Japanese, you will fortunately be presented with an animated map in which the proposal is outlined. If it starts by illustrating your current city then moves up and outlines one of an enemy’s, and it is coming from a militant miscreant like Zhang Fei, you can certainly assume it is an attack suggestion. With a little experience, this system should be very clear and easy to understand. Give it a shot! Here you can view all officers in any given military unit (see the screenshot above). Press right or left to highlight your selection, and confirm to bring up an individual officer profile for greater details. An icon indicates a given officer’s role at the top, followed by their name in Chinese and Japanese below. Further down, you see each officer’s age (they can die of old age), a graphic depicting their rank (the city title for a unit’s governor) and bars (yellow being good) depicting Martial (military capacity, war, strength), Leadership (ability to govern troops), Politics (diplomacy), Intelligence (plots), and Troops (yeah, you know this one). Here is a sample officer profile – in this case, Liu Bei. In the upper left-hand corner you have their name in white Chinese (left) and Japanese (right) characters, their personal rank (the city’s title in this case, as Liu Bei governs Xuzhou) in the bottom-left, and their portrait. The upper right-hand box is the unit to which they are currently assigned. On the left-hand side of this box, the unit’s leader (again with name in Chinese and Japanese) and the city name (Xuzhou). To the right, the various officers in the unit. A red and white dashed box indicates this officer’s position. Below, their statistics. On the left-hand column, you have Troops, some measurement we believe to be a measure of loyalty or reliability, but we aren’t absolutely certain – write us if you know, the characters are 信頼, their combat Special Ability (such as dueling, or an arrow barrage), and their Personality (in this case ‘Loyal and Upright’). On the right-hand column, you have their basic statistics, Martial (war ability, strength), Leadership (ability to lead troops), Politics (diplomacy), and Intelligence (plots). As you might have expected, you aren’t going to unify China through diplomacy and plots alone, and that won’t be your enemies’ interest as well. These differences will be settled with blood and sweat on the battlefield. Here, we introduce the battle system of Destiny of an Emperor III so you can dive in, fully prepared to hold your own. Battle is based on a grid layout. You begin on a field, and the defender controls a castle. 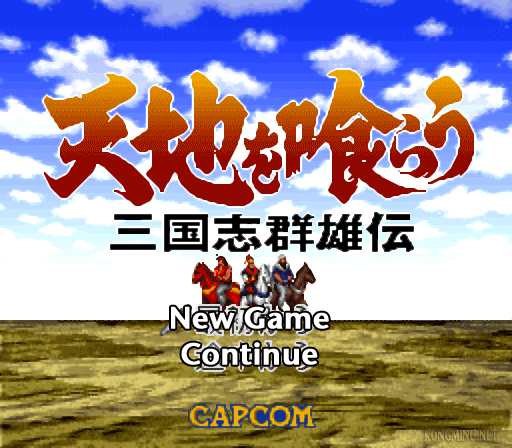 Unit command follows the same principles found in Koei’s Romance of the Three Kingdoms. Move the white square cursor over the unit you wish to command, confirm, and you will be presented with a sub-menu in the upper left-hand screen corner. Move allows you to move a unit (read on), Attack allows you to attack an enemy unit (see Battles: Attacking below), Special allows you to perform a Special Attack (see Battles: Attacking below), Formation allows you to change your formation (i.e. Unit Type) between Infantry, Cavalry, and Archer, and Wait is equivalent to cancel. An area around your unit will also be highlighted – this is your available movement range. Move your cursor to any area inside it and confirm to move the active unit. Take note of the Action Points (the baubles in the main command screen, some lit green, others dimmed). Each time you take an action you expire an action point. When they run out, you can issue no further commands, and you must end your turn (see below). Confirm on an empty space to bring up your battle options. End Turn, the top option, ends your current action phase and gives an enemy a turn to oppose you. This, too, functions in similar principle to many installations of Koei’s Romance of the Three Kingdoms game series. Reserves allows you to swap units with other units in reserve (see the kingdom management screenshots in the previous section). Retreat, of course, orders your retreat from the battlefield. Ah, the bread-and-butter of combat. So much to cover. Your options menu affords you control of your unit (mostly covered in Battles: Overview and Movement) but here we discuss two combat options, Attack and Special. Attack is a regular general attack based on your Martial combat ability. You deal, and receive, damage. Special unleashes a special attack. For most warriors, this initiates a duel. If you have the higher Martial ability you stand a chance to deal great damage, but if yours is lower, you could be badly injured. If the enemy is much weaker they may refuse your challenge. Other generals may have different Special abilities (there are not many) such as Zhuge Liang and his Barrage attack, which is not based on his Martial ability and causes heavy damage. Experiment to learn more! The active officer and his talents are detailed in the bottom window (as long as one is active). Portrait and name are shown to the left, unit statistics are shown to the right. The top bar is the unit’s morale, which ties in to their general combat ability. Second comes their soldiers (ties in to combat ability and, of course, when it reaches 0 the unit is defeated and possibly captured), and at the bottom, Navy (a measure of combat ability on water). The orange character in the center displays the current unit type (change with ‘Formation’), but you can deduce as much simply by checking the on-screen graphic (in this case Cavalry). On the right-hand side, measurements of Movement, Attack, and Scouting (which may be an indication of how close to an enemy this unit must be before it can see it). This is an example of a duel. Both officers taunt each other, and charge into combat. One (in this case, Zhang Fei, of course) emerges victorious, and the other suffers damage. If a normal attack, both commanders appear with soldiers, and they rush into each other. Casualties are sustained on both sides, and already-weakened units fight at a significant disadvantage and are prone to defeat even if led by a powerful commander. Other Special Abilities result in different graphics with different tendencies for delivering damage. Experiment and find out! Destiny of an Emperor III (SNES) Enjoy the Game! Now you know everything you need to know in order to enjoy Capcom’s deviation from the traditional Destiny of an Emperor template for the Super Nintendo. The game features no prominent story which you must understand in order to play on, so from here, all you must do is familiarize yourself with the menus and combat system, and soon you will be well on your way to the goal of conquering China.